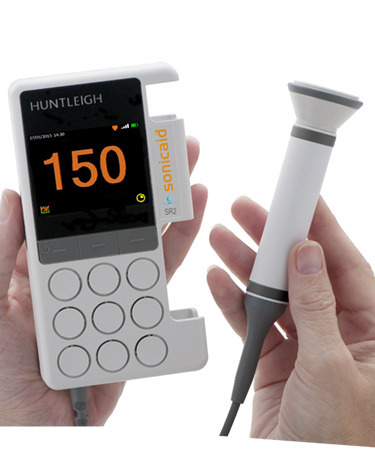 These high sensitivity handheld Digital Dopplers are intended for general purpose screening of the fetal heart at all stages of pregnancy from as early as 8-10 weeks, right through to labour. The attached probes are waterproof (IPX7) for high sensitivity FHR detection in both normal use and in waterbirth monitoring. • Big Numbers & Trace Displayed in High Resolution Colour. • Data Storage on Micro SD Cards. • Integrated Charging & Connectivity. • Dynamic Digital Noise Reduction.